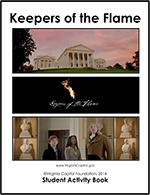 Capitol visitors can learn more about Virginia’s central role in American history, thanks to a film, Keepers of the Flame, produced by the Virginia Capitol Foundation with assistance from actor, filmmaker, and Virginia native Tim Reid. The 20-minute visually-interactive film is available in the Virginia Capitol Visitor Extension for viewing seven days a week during regular tour hours. For visitors that can not view the film at the Capitol, it is also presented below via YouTube. A new Keepers of the Flame student activity book has been developed and is available for download. The film and Student Activity Book correlate with the 2008 History and Social Science Standards of Learning for Virginia Studies. The activity book was created by Tanya Siwik, a Fairfax County Public Schools teacher, in collaboration with Betsy Barton, Specialist for History and Social Science for the Commonwealth of Virginia’s Department of Education.